Pit People is The Behemoth's next game. You may be familiar with The Behemoth since they are the minds behind Castle Crashers and Battleblock Theater. In case you aren't, maybe check those games out. At any rate, the developer is drawing close to releasing the title they're currently working on, Pit People, on Steam's Early Access platform. After a closed beta session, the game will be purchasable, starting this Friday, to those who want to get an early taste of what's to come and provide feedback. 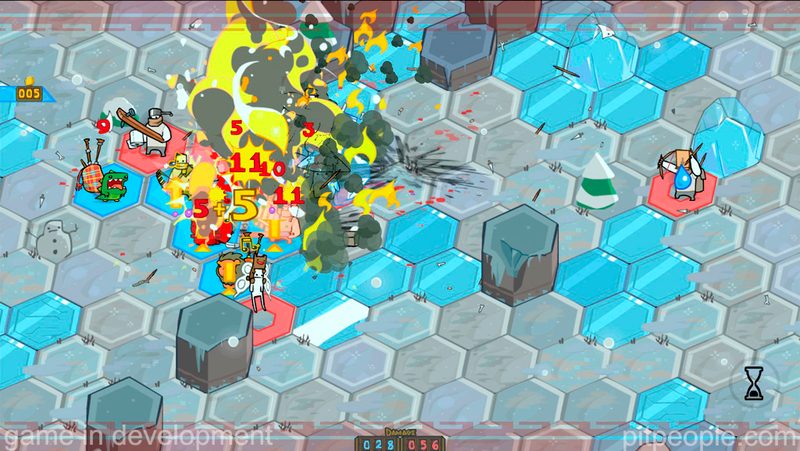 Pit People is a game that puts together real time exploration and turn-based fights. The trick is that, while you can tell party members where to go, their attack targets cannot be directly chosen. Instead, you'll have to rely on careful positioning so as to minimze the number of possible targets, thus, increasing the chance of effective attacks. What I saw during the Closed Beta looked promising and, also, hillarious. The Early Access version of Pit People comes with a portion of the story quest, several world maps, challenges and a PvP mode. The game can be played both solo or alongside a friend in local or online two player co-op. The Behemoth plan to keep the game in Early Access somewhere between a few months and a year. During this time, the title will also be cheaper than upon release. Pit People will also be available on Xbox Game Preview.